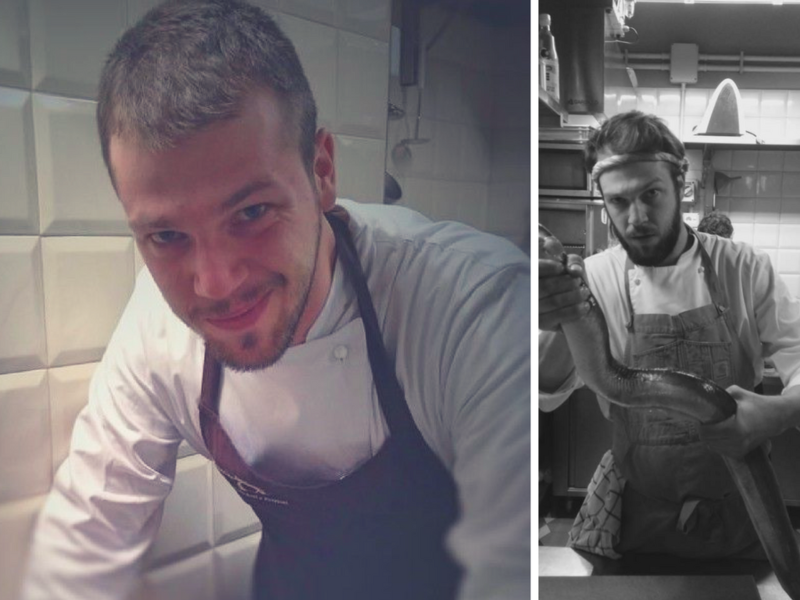 Marco Bravin, a young breeze in the kitchen among tradition and creative innovation, from Veneto to the capital. 1) You are very young, yet you have already collected a number of important experiences abroad and Italy, like the 3 years spent at the Propaganda Café. Now you are a liter of Vineria Vineria: how are your past experiences contributing to the creation of Liters? Before working at Litro in Rome, I learned to refine my cooking idea in Ferrara at the Don Giovanni restaurant, where I worked for 3 years. I’ve learned a lot from them by managing high quality products, I can say that it was my “gym”. The owners love cooking with authentic products such as fish freshly fished, wild animals caught in the valleys of Emilia Romagna. This all touched my heart and I tried to place those values at the base of my dishes. Today, I try to take inspiration from those experiences by preparing dishes that I firstly like and then that can give customers pleasure by making them rediscover lost tastes with raw materials whose origin is certified. 2) How was the passion for cooking created and what made you do your job? Indeed I started to cook and to get closer to food when I was very young. Certainly I’ve to thank my family: my mom has always worked in gastronomy for example, my grandfather was a pastry chef and my dad likes to go hunting. This is where my love for nature, fishing, hunting, organic farming was born. I personally love everything that is true and genuine and my secret is to bring this philosophy into the kitchen using seasonal products and rediscovering the tastes of old time. My passion therefore has come while getting close to nature and its wildest aspects, I would say, but certainly also with the most genuine and healthy ones. 3) At Litro you use a lot of eco-friendly products, biodynamic raw materials, such as high-quality wines, and perhaps from small producers. Can you give us Some Italian example of these excellences that you use in the kitchen? Here in Litro together with the owner Maurizio Bistocchi we certainly want to propose biodynamic wines but our pursuit of authentic and natural food reverberates, for example, also on our vegetables. Our restaurant is supplied exclusively by our biodynamic vegetable garden, which is a few kilometers from here (in the Monterotondo area, in Rome) where we directly grow naturally vegetables. I can tell you, for example regarding fish, that we do not serve fish that are bred but only fished in the open sea. So we serve even blue fish, commonly called “poor” fish, but certainly fished and not bred. For example, I use a lot of rock trellis in my sea dishes, cooked in various ways. Talking about meat, I love wild game, such as ducks coming from the sea and migrating to our Venetian valleys. 4) What do you think is the strength of Made in Italy, of our food and our gastronomic culture? In my opinion, Italy is the number one country in the world for food potentials. We have everything. We live in a peninsula between seas, mountains, and hills. We have hundreds of types of fruit and vegetable. Unfortunately, there is no co-ordination on our incredible heritage of food & beverage. We should focus more on small producers trying to push them and let them be discovered abroad. That is also another face of our made in Italy. I think of small producers of cold cuts, oil, and cheeses. We have often hidden and unpublished excellence. I think that unlike other European cuisines, the Italian one is the most varied and potentially even richer in terms of nutritional values. At least on paper, we all know the benefits of mediterranean diet. On this belief there is no comparison with any other European cuisine. I certainly want to grow and refine the philosophy of my natural cuisine. My strength is to listen to what nature offers us constantly. Try to make them a treasure and be focused on the authentic flavors that we have in our country, discovering and revising the old recipes. For this reason I spend long time, when I can, in the contact with nature, fishing and hunting. My passion is cooking so for now I just want to keep on being a good chef by refining my techniques and my recipes. I take the opportunity to greet all the friends of I Love Italian Food, and I am one of your most trusted readers!